Because you asked, we’re doing another run of DFA tees! Show off your fetish pride! Not only will you be stylin’, but you’ll also help us gather seed money for future activities. DFA tees are high-quality, 100% cotton black shirts with a flattering athletic cut. The DFA logo is featured in a pocket-sized print on the front and emblazoned boldly across the back. You can snag one (or more) for only $15 each! All funds in excess of costs will go into our activity fund. The tees will be available at Gear, so you don’t need to pay in advance. But to help us get a sense of how many to order, please email us with the number of shirts you’d like and your size(s): Small, Medium, Large or XL. Please reply by July 18, 2014. Stand out from the crowd and declare your membership in our brotherhood. 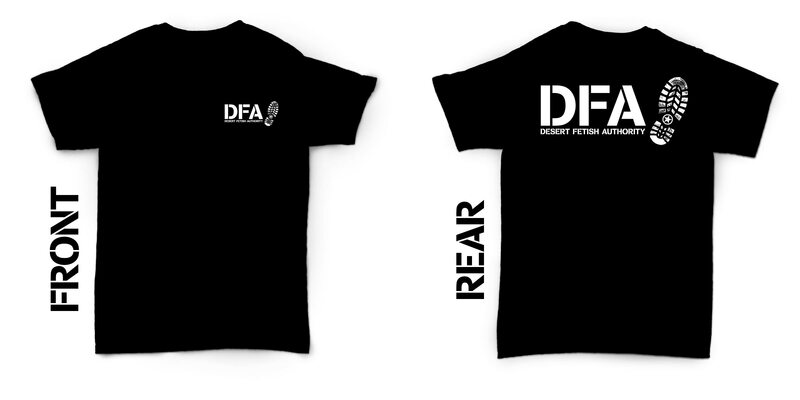 Get a DFA tee!